I am from a city that tears its buildings down; or lets them fall down, then blames them for being old, dirty, unsafe and unhealthy. Yet I am from a place where I am constantly astounded by my surroundings – the structures and the history and stories embedded in the grains of these living materials. A decade ago I bought a shell of a house at auction in my hometown of Philadelphia, and set about fixing it up. I did this by finding other people in similar situations with squalid buildings, and work trading with them in order to gain skills and experience as well as to build a network of help when extra hands are what’s needed. After dealing with all the stuff that came with the building, then making sure everything was structurally sound in the foundation and the roof, I set out to tackle the main task of restoration: the removal of inappropriate substances that had accumulated on surfaces over the course of a century. This was nasty business. Layers of lead paint, old varnish removal, bad plaster patches, wallpaper that made me smell like sour babies, mold all over everything; it’s amazing the kinds of things that would come out of these 19th century walls! I found that when I got rid of all these layers of plastic and synthetic materials, when I got down to the bare bones of the building, I could finally take off my respirator and take a deep breath. And it felt like the building was taking a deep breath with me. And I realize that this squalid place suddenly smells good, and the light is dynamic and beautiful; that this old building is a natural building, that nearly every building constructed before the 1950s is a natural building, made of high fired earth and our old growth forests. I believe in these old buildings. I have witnessed how they can be salvaged from a burn pile, talked out of their slouch towards decay and brought back to life; and how they acknowledge the artisan who performs this resurrection, a conversation between the landscape and the humans who wish to inhabit the space. I’ve been joking for some time that what I do is Architectural Healing Arts, but over time I’ve come to see this as a real thing, and probably the best description I can conjure to describe the process of coaxing a mess of natural materials back to life. After seven years of doing this kind of restoration, this removal of inappropriate substances, I could no longer ignore how toxic I felt. I loved the work, but felt like I was infested with a potpourri of heavy metals, that despite an accumulation of years spent in a respirator, I had nonetheless ingested a fair share of harmful particulate matter. So in 2011 I left Philly and returned to my other home of Oregon, and it was here that I discovered the wonder of earthen plasters and natural finishes. 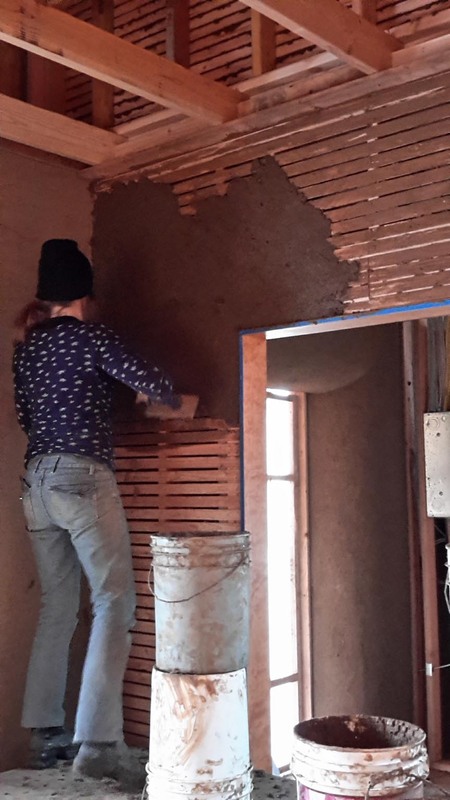 Clay plaster, as a building material, is much more forgiving than the gypsum plasters that I had previously worked with and it’s amazing how beautiful a wall made of mud can be. But more than that, I started feeling the detoxifying effects of the clay, like its presence on my flesh was lessening the heavy metals, the pinched poisoned feeling, like all my cells were happier and healthier. 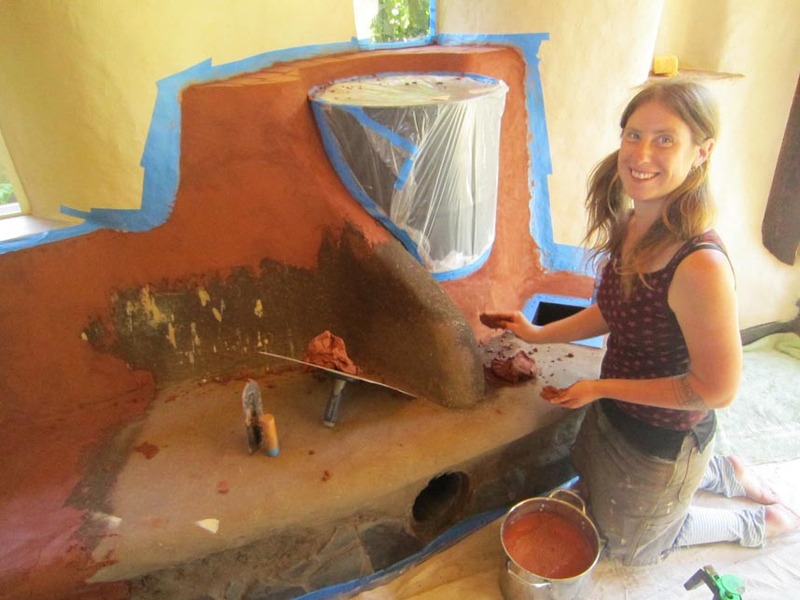 So for the past four years I have been blissfully following the mud- working, learning and teaching about earthen plasters and wall systems. But there is so much left to learn! There are traditions of vernacular architecture all across the globe, and a need for more of us to learn these techniques so that we can be skilled and efficient at applying these beneficial finishes and training others to do the same. We all deserve to live in healthy structures, in natural detoxifying environments. I am humbled and thrilled by this opportunity to study with a Japanese plaster master, and thank you with immense gratitude for your interest and support in our project.